Tillandsias, or "airplants" (as they are often known), are among the weirdest, most varied, and most fascinating plants on earth. Some look like "normal" plants, and some look like something from outer space. They vary in size from more than 1.2 meters across and 2 meters high to less than fingernail size. Some are grey, some are green; some are fuzzy, some are smooth; their flowers vary from spectacular large multi-pronged bracts to almost invisible, and are mostly odourless, counteracted by a few species with beautiful powerfully-perfumed flowers. as trees. They are not parasitic and cause no harm to their host plants, only using them for support. 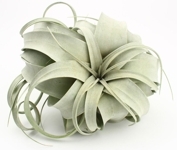 Some are true aerophytes (air plants), which never develop roots; some even grow on shifting desert soil. 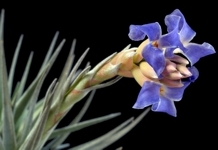 The Tillandsia genus is part of the Bromeliad family, with more than 700 known species, and more are discovered almost daily, occuring naturally in South and Central America, the West Indies, and the southern parts of the USA. In nature they are found in diverse environments: from equatorial tropical rain forests to the high Andes mountains, arid rocky coastal deserts and Louisiana swamps. They grow on tree trunks and rocks, even on roofs and telephone lines, or the prines of large cacti! In their natural environment Tillandsias absorb water and nutrients through their leaves, and most species will grow under normal garden conditions, although additional watering and feeding will encourage good growth and flowering. Their roots are usually poorly developed and have lost all "normal" plant functions—any roots that do form are used only to anchor the plant, and can be removed without harm, making it easier to mount your plant. The roots may or may not grow back, but it doesn't matter to the welfare of your plant. 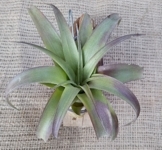 Tillandsias can be divided into two groups: mesic and xeric. The mesic species tend to be greener and shinier than the xerics, and can generally be found in cool humid climates, often in the tree canopy of the South and North American rainforests, clinging to branches under the leaf canopy. They like bright indirect light, good airflow and frequent rainfall. The xeric species usually live in precipitation-poor areas, often in full sun, on rocks, the high branches of dry forests and shrubland, some even on bare desert sand. They are greyer in colour, sometimes even silver or almost white, and their leaves often look furry due to leaf structures called trichomes, used to absorb whatever water they can get. In cultivation they need far less water, and prefer small doses of direct sunlight and plenty of air movement. The big difference between mesic and xeric varieties is the pronounced appearance of trichomes on the xeric varieties. Though the mesic species also have trichomes, they are mostly invisible—on the xerics these structures are much more developed and visible, to absorb every little bit of water available to it. When xerics get wet the trichomes absorb water and the plant becomes more green and shiny—as the water is used or evaporates, the leaves return to the normal silvery colours. 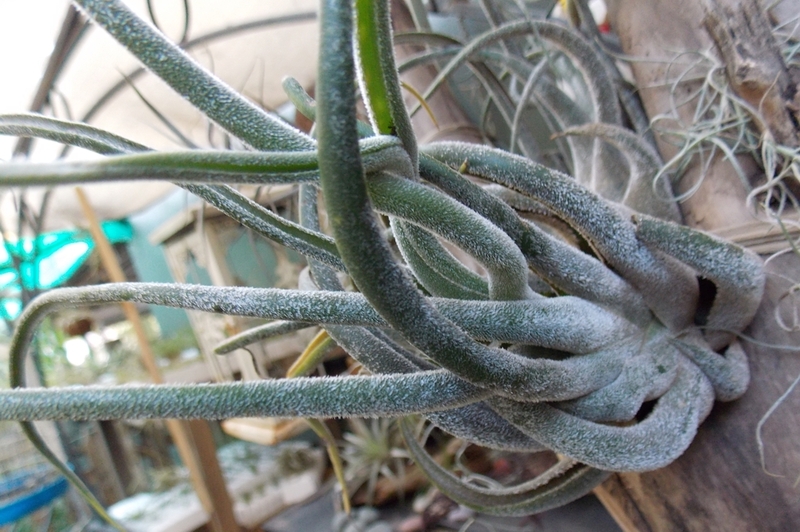 To grow in harsh conditions tillandsias have also adapted their photosynthesis. Most plants breathe both day and night, but in hot dry conditions the plant also loses moisture when breathing during the heat of the day. 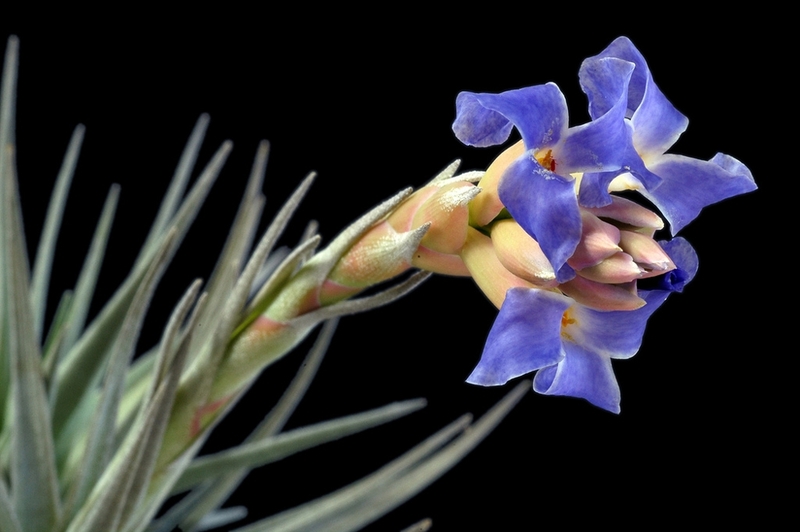 To conserve their moisture, arid growing tillandsias use a specialised method known as Crassulacean Acid Metabolism (CAM) respiration: they keep their stomas closed in the daytime, breathing through the night when lower temperatures means less transpiration. 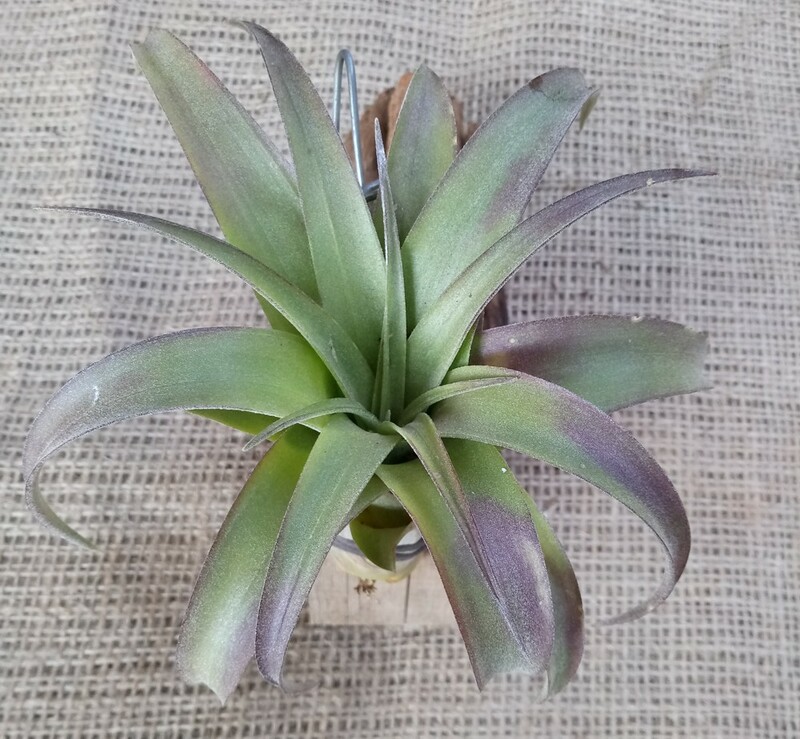 Because they seem to grow in air with no need for soil or any other growth medium, Tillandsias are often called "air plants". This unfortunate misnomer is responsible for the deaths of countless tillandsias, because people often think growing in air means growing ON air—tillandsias, like all living things, definitely need more than air to survive. Having said this,Tillandsias are actually easy to grow, among the most carefree and care-forgiving of any plants on Earth. 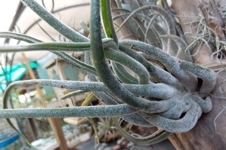 They mostly die because of gross neglect or lack of knowledge; to thrive, Tillandsias need water, light, and air movement. Mess up these requirements, and they will die—like any other plant! Give them the basics, and they'll give you years of pleasure. The genus Tillandsia was named by Carl Linnaeus after the Swedish physician and botanist Dr. Elias Tillandz (originally Tillander) (1640–1693). Design © 2014 by Treebeard & Co. Banner background graphic courtesy of sheepscotgeneral.com.